HandUp Congo co-founders Anne and Lucy have a connection to Congo that is deeply personal. In 1912, Lucy and Anne’s grandparents arrived in Congo, then a Belgian colony. American missionaries, HC (Clay) and Tabitha (Toby) Hobgood were assigned to Lotumbe village in Equateur Province. There Clay’s role was as chief of station, and as missionary pastor of the vast Lotumbe region. Toby directed the Women’s School, and homeschooled her six children. Clay and Toby became adept linguists, translating the local Lonkundo language so that – for the first time – church-goers could have Bibles, hymns and educational resources. Their son Ben, Anne and Lucy's father, happily grew up fishing, hunting and swimming with other village boys, and also maintained the family’s garden plots as well as their chickens and rabbits. Their father Ben with his playmate, Mbongo, after a successful fishing trip. They caught an 18 kilo ntula (electric eel). At age 15, Ben returned to the USA where he completed high school, university and graduate theology seminary. 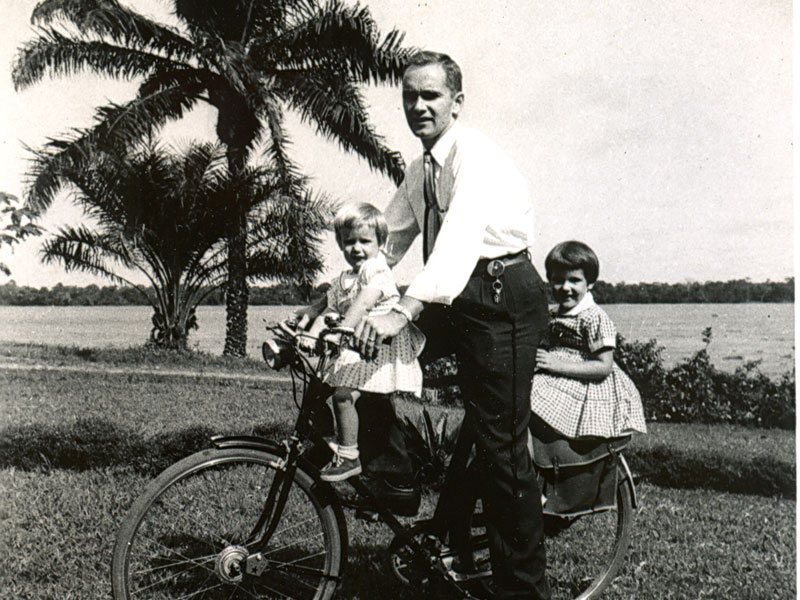 In 1955, he returned to Congo with his wife, Betsy, and young daughters Anne and Lucy. Their third daughter, Susan, was born shortly after the family’s return to Congo. Anne (right) and Lucy (left) with their father Ben taking a ride along the Congo River. Betsy, Anne and Lucy's mother, organised classes to teach Congolese women reading, writing and cooking. These classes were conducted in the shade of a large mango tree, with the help of the family’s veteran cook, Bongonda. Betsy teaches while Anne plays in the background. While the girls attended school, their missionary parents worked as educators and helped found the Free University of the Congo, now called Congo Protestant University or in French, Université Protestante au Congo (UPC). The university has grown from three students to more than 8,500. It is now based in Congo’s capitol, Kinshasa. After graduating from high school they attended American universities, married and began careers. Ben and Betsy left Congo for the USA in 1970, with Ben working in university administration and Betsy as a high school librarian. Upon retirement, Ben initiated UPC’s North American Liaison Bureau and in a pro bono capacity raised more than $1 million in scholarship funds aimed at helping young Congolese leaders who have gone on to build their nation. Ben’s Congolese friends affectionately said he was 'an American with a Congolese heart' who could make positive things happen with few tools and little money. In 2004, the family revisited the Congo. Anne and Lucy were so moved by the challenges facing women in Lotumbe that they asked how they could help. With the gift of Two Sewing Machines, a sewing school was born, resulting in student uniforms, newborn clothes and blankets and properly outfitted medical personnel. Soon HandUp Congo was established, with the sisters collaborating with women friends and other supporters to raise awareness about needs and projects identified by their Congolese project partners. Lotumbe is a tiny, remote village, with no electricity, running water or roads. It has been decimated by ongoing conflict, disease and poverty. Lotumbe is mainly accessible by canoe, or after walking for many miles on paths through the dense Equatorial forest. Seeing Congo through adult eyes was an epiphany for us. We saw how hard the women of Lotumbe had to work to keep their families fed, clothed and educated. In 2004 Lucy and Anne's father died and his ashes were returned to Lotumbe for burial. In 2017 their mother's ashes were buried there with their father's. The commitment to the people of the Congo continues. 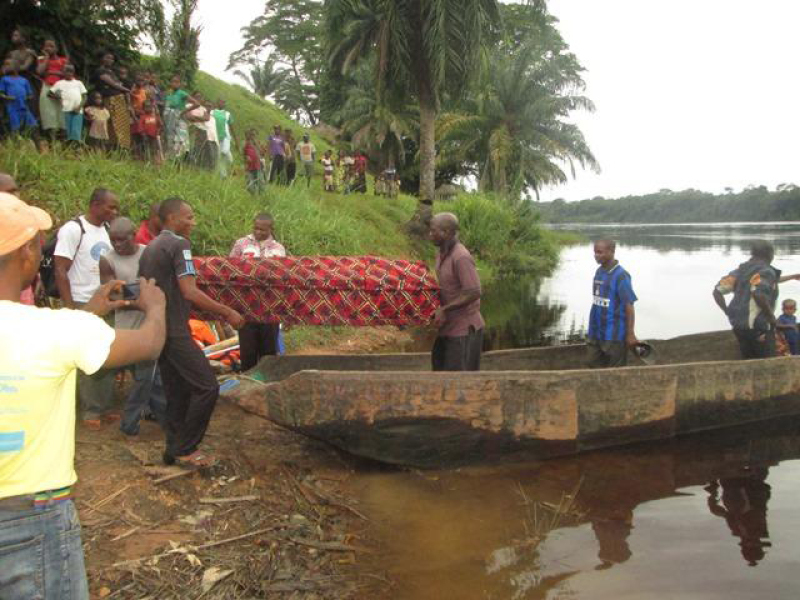 While raising awareness of Congo’s needs to the International community, HandUp Congo actively works with partners to support community led initiatives.